The chorus starts with a sped-up, electronically-filtered voice that can only be described as an ancestor of the dreaded Crazy Frog. Crazy Frog? What the hell! This was the era of robot voices, telling us we can boogie down, taking us to Funkytown, and asking do you feel like we do! 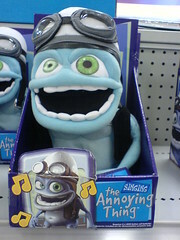 But it seems we’ve found the ur-Crazy Frog; the missing link between Alvin and the Chipmunks and the wretched toilet-bowl-cleanser-blue creature we suffer with today. Like the modern annoying thing, the ur-Crazy Frog is unintelligible, starting the chorus with a line that might be, “Got it all together don’t you baby?” But who wants their Crazy Frog to speak complete sentences? Worse yet, the ur-Frog and a companion get their own spoken word interlude at the end of the song. It’s bad enough that the creature made “Murphy’s Law” live up to its name. It’s worse to think that it reproduced.